The system allows an operator to effortlessly move a multi-engine Verado-powered boat in any direction – including sideways, diagonally or spinning on its own axis – with a simple push or twist of a joystick. The operator controls the throttle, shifting and steering with one hand, and the joystick works in conjunction with the independently steered engines to move the boat in the desired direction. 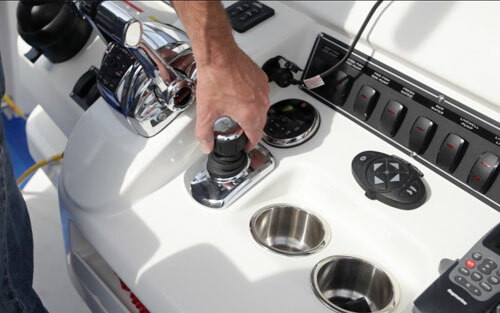 No other outboard joystick control system offers the advanced features of Mercury Joystick Piloting for Outboards, which includes Skyhook digital anchor, VesselView engine information display, and an integrated autopilot system.